We produced & installed all elements of the Ted Baker ‘Colour by Numbers’ pop-up shop at Old Street Station, in the City of London. Ted Baker, the high street fashion retailer, utilised the trendy east London location with high footfall to launch its latest collection ‘Colour by numbers’. Our team worked through the night for a week to get the store ready for opening. The pop-up employs a clean, monochrome colour scheme, complete with translucent opalescent panels laid out in a graphic zigzag pattern. By using modern materials and shapes, it created a fresh, serene backdrop that fitted in perfectly with the Colour by Numbers collection. As well as showcasing the new collection, the five-week pop-up hosted yoga every Wednesday with “light and colour therapy techniques”, and on Thursdays the space was open to walk-in nail appointments. There were also styling events held by fashion influencers. Over its 6 week period, the pop-up shop had a passing footfall of over 1,000,000 people, generating great brand awareness for the new Colour by Numbers collection. 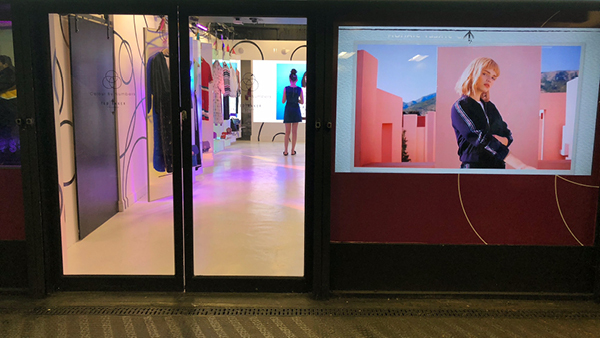 The pop-up generated a lot of interest with coverage across a number of leading publications including The Evening Standard, Retail Focus and Campaign.